Intermarkets, Author at Intermarkets Inc. Instant Articles are a fast and beautiful way for readers to access content directly from their Facebook Newsfeed. Debuting in May of 2015, Facebook Instant Articles are nearing their first birthday, and in that time marketers and large publishers have had a chance to experiment with publishing full articles directly to the newsfeed without redirecting users to an external site. When the project was first proposed to publishers, one of the major advantages was that hosting the content on Facebook’s servers dramatically reduced load times. As the name implies, Instant Articles found articles loading nearly instantly within the app. External links took 5-10 seconds by the time the browser would launch and the page could load. The purported benefit was that users would click on an article more readily as they could more immediately determine if the content was of interest. The goal for many publishers is for pages to launch in under two seconds. In a move that surprised many, the terms of these partnerships were surprisingly favorable for publishers, allowing them to sell and embed their own ads and receive 100% of the revenue, or use Facebook’s in-house advertising services, surrendering 30% of the profits in the revenue sharing deal. Facebook also provides advanced reporting metric courtesy of Google Analytics and Adobe Omniture to ensure publishers could continue to monitor performance. But while the initial impressions seemed mutually beneficial, there are areas where publishers have cause for concern both in the near-term and in the big picture when considering the service’s viability. With great power comes great responsibility and Facebook is increasingly becoming the primary traffic source for many publishers. As this dynamic and the percentage of readers continues to increase, it’s possible that publishers will stand to lose leverage in the relationship if they’re beholden to a channel providing such a large percentage of viewers. At present, Facebook limits the number of advertisements (two) that publishers can run within an Instant Article, and currently doesn’t allow native ads to run. While the rationale is to boost of the value of the content in the eyes of the reader by preventing content from being over-stuffed with promotional material, it’s an element of control that many publishers and advertisers are finding themselves reluctant to give up. Since Instant Article content is hosted on Facebook’s servers rather than the publisher’s, it stands to reason that traffic volume may shift from one source to the next when implementing the strategy. But while a reader going from column A to column B is fine, publishers are concerned with the ability for the reader to continue their journey. Since the reader never leaves the app they’re unable to fully explore the publisher’s site without a navigation bar or quality calls to action, no matter how helpful your hyperlinks, effectively limiting the time spent consuming conduct or finding other material. Many publishers view the service with cautious optimism, but Facebook’s terms of service will be the pivotal point in the success of the program and its publishers. As we’ve seen with video, and then again with live video, Facebook’s newsfeed algorithms are subject to constant changes, so while the current environment is favorable, the company’s history of rapid change is worries some as the next algorithmic iteration may devalue a publisher’s heavy investment in instant articles. To ignore the other titans of the internet is to turn a blind eye to competition. Facebook’s Instant Articles have seen momentum in partner acquisition, but the rollout to users was relatively slow, giving competitors ample time to respond. Google’s own “Accelerated Mobile Pages” (AMP) also dramatically reduces load times on mobile by leveraging simplified HTML code and the search engine’s page caching technique. Twitter seems to be aligning with the search giant and collaborated in the development of AMP, making an attractive alternative for publishers who want viewers to remain within their site’s ecosystem while maintaining total control over advertising. The potential red flags were evident this past March, when some publishers saw traffic decrease 20-25%, with no obvious explanations offered by either party. Like all innovation, Instant Articles are a work in progress. Facebook will continue to refine the offering, but emerging technology is often rough around the edges or even prone to unforeseen threats in the form of bugs, or shifting behavioral changes. The abnormality in March’s traffic might just be a blip on the radar, but some are concerned that it may be indicative of potential broader instability that needs attention. Ultimately, this battle for viewer attention is far from over, and publishers would always be wise to continue monitoring their individual performance but keep tabs on the industry as a whole to take the market’s pulse and identify trends signaling an opportunity to employ new techniques rather than go with the flow. Here at Intermarkets, we will be testing out Facebook Instant Articles in the upcoming weeks. We will be monitoring performance results closely to ensure that our users are getting the best user experience, distribution is consistent, and monetization remains strong. Wednesday, a number of Intermarketers attended the Advanced Programmatic Buyers & Sellers training in Washington DC. The all-day event was hosted by the IAB, the Interactive Advertising Bureau, who along with its 650+ member companies develops technical standards and best practices for the digital advertising industry. The class, led by Matt Prohaska of Prohaska Consulting, provided participants with a better understanding of the programmatic media ecosystem, working knowledge of the key technologies and programmatic ad stack across platforms. It also touched upon “Programmatic Guaranteed” and provided live demonstrations from vendors from both the ad tech side as well as from the buyer perspective. For Intermarkets it was a chance to really hone in on intricacies of Programmatic and learn the nuances of this ever growing digital buying mechanism. Recently eMarketer stated that programmatic digital display ad spending will reach over $22Bn in 2016, a jump of 39.7% over last year, which represents 67% of total digital display ad spending in the US. With such a large percentage, Intermarkets is committed to offering products and services in the way that people want to buy. The night cap was a chance to unwind, network and talk shop with our colleagues in the industry. The venue was the new and beautiful Washington Post Headquarters building. There was a wide mix of companies in attendance – publishers included – WashingtonPost, Philly.com, WebFinance, DailyCaller, IJReview to name a few; technology companies included OpenX, Rubicon Project; Agency representatives included such firms as Ogilvy and Mullen Lowe. The highlight of the night was a panel hosted by OpenX with Martin Calhoun, Director, Digital Advertising Operations and Yield Management at Philly.com and Jason Tollestrup – Director, Programmatic Advertising and Business Intelligence at the Washington Post. The discussion focused on programmatic and more specifically how each of the companies has spent the last year or two implementing header bidding solutions. Philly.com took a very cautious approach, making sure that they focused on the right partners and right solutions – as well as making sure they made changes that were in line with the entire sales strategy. Similarly at the Post, much of their time is evaluating the right partners and making sure that each new partner provides a unique quality about their demand. Our own Erik Requidan, VP of Sales and Programmatic, asked an interesting question about how buyers keep to date with everything that publishers and technology vendors are working on behind the scenes. Since each ad stack and publisher implementation is different, both panelists agreed that publishers need to spend more time with media buyers, to explain, uncover, and inform the best ways to interact with publishers. Banner ads have gone from simple images to a variety of advanced audio-visual formats delivered across channels to reach consumers wherever they are. Considering how to create an effective ad that will draw attention and generate clicks can be boiled down to these five points. Applying them to your ad concept will ensure that your creative speaks directly to your intended audience, driving conversions and making you money. This is the universal KEYSTONE. While I was writing this post, I thought to myself, “How do I craft my message?” Digging down I realized that I was outlining my thoughts based on who I was writing to—you! Make sure you have a clearly defined audience, that you understand who they are, what they’re looking for, and how they want to find it. Without this piece, you’re going to find the other four difficult to execute. Without knowing whom you’re trying to reach, you’re casting a wide net, which brings down the quality of your clicks. Are you selling a product, idea, or a cause? Make sure the audience knows what it is at first glance. With banner ads, you usually have a very slim window to earn attention from consumers online. Make sure that when they do spot your ad in the side bar of their favorite web page, it’s absolutely clear what you’re showing them. 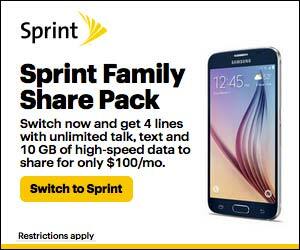 Sprint has a strong offer to draw families away from competitors with a hefty data package serving 4 lines for only $100/month. They do a great job here of giving a detailed yet brief description of the offer, which is enough to get curious buyers to click through and get more of the nitty-gritty from the landing page. Use clear, concise messaging. If consumers have to interpret your offer, chances are they’ll skip right by it. Short and sweet takes the cake. Turbotax knows that people are looking for easy, low-cost solutions to get their taxes done. 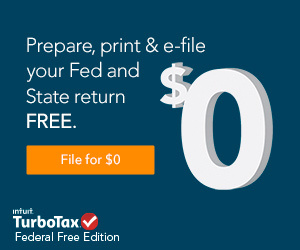 It’s no coincidence that you probably received your w-2 recently and have also started seeing ads like this on almost every website. A well-timed campaign. Pay attention to what’s going on in the world your audience lives in and what they’re interested in. Leverage relevant trends to supercharge your campaign without lifting any additional fingers or having to shell out more dollars. Again, it all ties back to truly knowing your audience. Ads like this are easy to understand, but I think 99% of us have learned one way or another that Mom was right, there is no such thing as absolutely “free”. 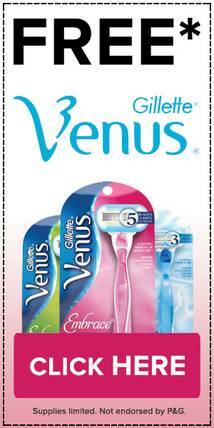 In my opinion banner ads like this one come across as bait, and I tend to leave them be. If I knew from the ad what I would have to provide in order to receive the free product, then I’d be more likely to click and explore the offer. Maybe it’s just a quick survey—harmless! But if you’re not telling me up front then I’m going to assume it’s something much, much worse. Be honest and transparent with your messaging. It builds trust and makes people want to do business with you. Let your customers know exactly what you’ve got to offer without beating around the bush with vaguely worded, fluffy catch phrases. If you have an innovative product or a meaningful cause you want to share, show them! This will increase the quality of your conversions by only bringing folks who are actually ready to be your customer. To summarize, or “TLDR” as they say nowadays, if you get to know your audience ahead of time, you can put together a simple yet effective ad that will get their attention. It shows that you take time to understand who they are and what they’re looking for, and you are ready to cater to their individual needs. It will build a relationship between you and your audience that fosters loyalty and a strong brand reputation.